Ask fellow campers about "Tiki RV Park & Campground" and nearby attractions. First time to the UP, campground close to the ferry to Mackinac Island. A must see and plan to spend the day. Every Saturday night there is fireworks in town. Nice office staff with very good local information. Would stay here again. We camped at Tiki RV Park & Campground in a Fifth Wheel. Superior location for surrounding area. Very helpful staff. Our rate is based on three nights a passport and one regular. Good utilities and handy dump station. We are a small motorhome but we watched larger fifth wheels have considerable difficulty getting into some sites. We camped at Tiki RV Park & Campground in a Motorhome. Obviously Mackinac Island is a must. But St. Ignace is a very interesting walk and tour of the waterfront. Handy to Sault Sainte Marie and also Castle Rock and the Indian casino. We were able to bike to the docs for the ferry and we took our bikes to the island. Owners were very rude. We camp all the time, never have been treated so poorly. We made reservations two months in advance for specific site. Upon arrival they flattly stated that they moved us. The assigned site was tiny with zero privacy. I went back to the office to see if there were any other options. The owner told me should leave and go to the KOA campground. The site we reserved but unable to use was open during our entire visit. Bathrooms old and not clean. Recreation room as advertised is abandoned. It's like nursing home of crabby old people. Each night, not a single person had a campfire or even rv lights on. Everyone went to bed by 9:00. They even complained about my six year old son riding his scooterat 8:30 pm. Never again, worst campground ever. We camped at Tiki RV Park & Campground in a Travel Trailer. We really enjoyed our stay at Tiki RV Resort. 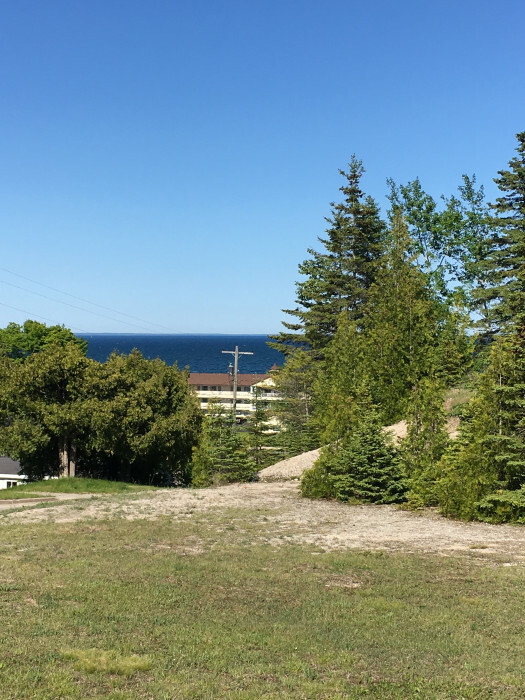 We had a bit of a view of Lake Huron and it was close to everything in St. Ignace. There isn't a lot to do in the campground itself but the location is great. We could either back into out space or pull in and back out to leave. We chose to pull in to be able to see the lake. We only had neighbors on the driver side of our coach so that when we put out our awning and sat outside we had all kinds of room. We put up our canopy and set up a table next to it for our griddle. 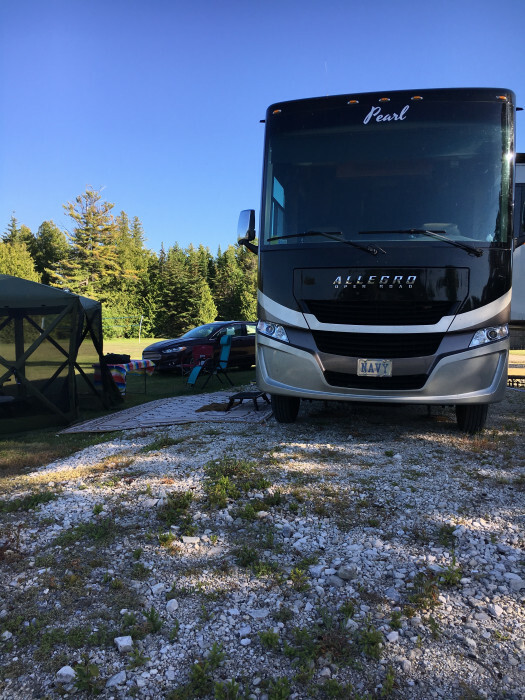 The only less-than-great aspect was that a slight slope away from our RV on the awning side and gravel under our patio rug made us be very careful walking around out there. We camped at Tiki RV Park & Campground in a Motorhome. Video crossing the Mackinaw Bridge. Take the ferry to Mackinac Island and spend the day...be sure to take the carriage tour to see the whole island. Talk with the rangers at Hiawatha Natl. Forest on Hwy 2 W about things to do nearby Go see the dunes on Lake Michigan. Shipwreck Museum at Whitefish Point (take repellent). The locks at Sault Ste. Marie. The list goes on....! Locals say that Mackinac or Mackinaw, it's all Mackinaw. 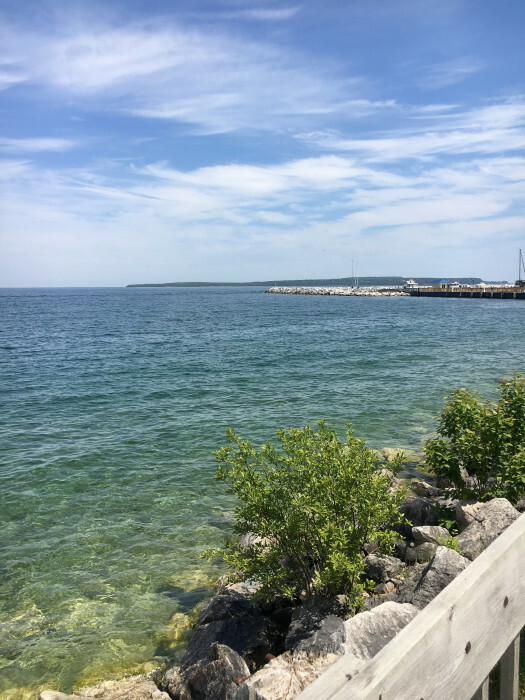 Certainly not a destination in itself, but this park is a great location to explore places from Petoskey to Mackinaw Island to Sault Ste Marie. Park is old and showing it's age and the office/"store" and laundry room are styes. Gravel roads with gravel or broken up concrete sites. Friendly staff and reasonably quiet with the location. Pull in sites 85 and 86 have a decent view of the lake. Site 86 is nice with no neighbor on passenger side. We would stay here again next time we're in the area. Good AT&T data and decent Verizon. We had clear sky for satellite reception. However most of the sites are in the treed area so satellite may be iffy. We camped at Tiki RV Park & Campground in a Motorhome. Convenient to ferries and town. Wi-Fi non existent. laundry clean. Our site was so unlevel we had to jack up our right front tire a foot. And our next door neighbor apparently lives there in a cargo trailer. She also likes to practice her bass guitar, usually during the day. If you are planning to arrive or depart on a Saturday, check the activities for St. Ignace. We got caught in traffic for a truck show coming in and were diverted to little tiny curvy roads to get thru town. We left a day early to avoid a run across the Mackinac Bridge. But the staff was helpful and friendly. We camped at Tiki RV Park & Campground in a Motorhome. Stayed two nights. Greeted with friendly, efficient, and quite informative receptionist. We were given a map to locate our site, which was within view of the office. Level site, easy hook ups, clean, friendly, several sites for several sized rigs. Special tent area for tent campers. Will return to Tiki Campground. Highly recommended. We camped at Tiki RV Park & Campground in a Motorhome. While visiting we went to Mackinac Island. 50 amp, W&E back in site. Only a couple of OTA TV signals available, WIFI is basically unusable most of the time. Plenty of shade here. We camped at Tiki RV Park & Campground in a Motorhome. Mackinac Island nearby, plenty of tourist shops, eateries close by. Great views of the lake from town. Many associated lake activities available. Convenient to town. Limited in Sat availability. We camped at Tiki RV Park & Campground in a Motorhome. This park was fine while visiting the area especially with the Escapee and Good Sam discounts. The roads in the park are on the tight side and most sites in the park are mostly level but our sitting area was very sloped making it pretty uncomfortable to sit outside. We would stay here again. We camped at Tiki RV Park & Campground in a Fifth Wheel. There is a shuttle to the ferry terminal to visit Mackinac Island which is nice. Downtown St Ignace is a nice bike ride away. Outstanding! We stayed at Tiki RV Park in St. Ignace, MI for 11 nights over the 4th of July holiday and enjoyed every bit of it. Tiki RV Park is on the north side of town up on a hill just off the main waterfront road. There are some sites in the campground that have a view of the lake. I highly recommend reservations ahead of time if you want full hookup and/or a lake view. The park is clean with gravel roads and grass/gravel sites. Water pressure was fine and electric was steady. It is a little tight. However, it was packed over 4th of July and we did not feel cramped. Of course we were already here and settled in and not trying to back in to a site with RV's on all sides. Cell phone service (Verizon) at the park isn't too good (it was strong enough to hotspot but phone calls would drop), but everywhere else in town it is fine. The park has Wifi but don't bother. I realize that I gave this review a 10 and stated it was outstanding and, in my opinion, it is - even though I have pointed out some negatives. The negatives did NOT take away from the overall experience of the town, the beauty, the RV park and the WONDERFUL temperatures of 60's and low 70's. We would come back. In fact, if we weren't full-time and mobile, we would consider spending the whole summer here. 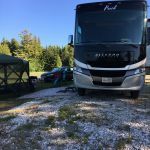 We camped at Tiki RV Park & Campground in a Fifth Wheel. There are ferry services that go back and forth to Mackinac Island. Along the waterfront there is a walkway with benches. Nice to sit and watch the ferries (with their rooster tails), watch people, take pictures of the lighthouse and read. There are some fairly good restaurants and cute shops. There is also a Bridge View Park that affords a gorgeous view of the Mackinac Bridge. Lovely place!!!!! The town of St. Ignace is beautiful! Really beautiful. It is somewhat touristy, but nothing like Mackinaw City. The main town is along the waterfront as well as everything else. First Impression: Good roadside appearance but close-up suggests an aging CG. Safety: no concerns. Access: We came in on US-2 from the west, through town (road needs resurfaced). Good signage, turn west on South Airport road, uphill. GPS took us right in. Office: Friendly staff. Office doubles as rec room but looks more like the remnant of a garage sale. Junk in piles - not appealing. Credit cards accepted. Call for reservations. All sorts of price discounts (AARP, Good Sam, Escapees, etc), including veterans. Facilities: No pool, spa, or fitness room. Small, clean laundry room. Acceptable restrooms (floor needs serious cleaning) with private room showers (score "B"). No propane sales. No playground. No off-leash dog run. Campground: Not in a flood plain. Roads are packed gravel with gentle turns and no overhead obstacles. Big rig, pull-through section, tricky in/out. I watched a big coach have problems in #83. Multiple tent areas but no yurts or cabins. Sites are not cramped; pull-through and back-in, grass and shrubbery landscaping, sufficiently level. Utility locations vary. Electric is 20/30, some 50; no meters. Adequate water pressure and taste. Sewer pipe is 4" threaded, below ground level with concrete ring. No patios; aged, "ok" picnic tables. Fires in rings only. Trees obstruct satellite views on some sites. No cable TV. OTA TV found 12 channels with good reception. Free Wi-Fi but very unstable (system upgrades in process). Verizon phone and 4G at 2 bars. No recycle bins. Noise: no railroad; some local aircraft; no traffic; no interstate. Bugs (mid June): small red ants, pre-treat is recommended. Lots of mosquitoes. Runners: CG roads marginal for running, no fitness room so no treadmills. Yoga: no good place for your mat. Conclusion: good price for a tourist destination. We camped at Tiki RV Park & Campground in a Fifth Wheel. St. Ignace, Michigan is a quaint, small, cozy, tourist trap. Lots of small shops selling trinkets, souvenirs, gifts. Local restaurants. Fast food chains located west on US-2 (around the interstate). Only national chain restaurant is Big Boy. Ace Hardware. Banks. No RV shops or dealers. No Walmart. Local diesel at $2.479. Passenger ferries take visitors to Mackinac Island for around $26/person, $10/bicycle (round trip). Renting a bike on the island is very expensive. Nice park close to town. Gravel roads with pull-through and back-in sites with table and fire pits. Most large sites with only a few trees while most small sites are tucked into forest. Quiet. No rec room, pool, or playground, and no activities. Utilities OK. Weak WiFi at some sites, none at other sites. Staff friendly or helpful. OK for either camping or for big rigs and travelers. Would stay there again. Good value for area. We camped at Tiki RV Park & Campground in a Fifth Wheel. Free shuttle to ferry to Mackinaw Island. Older campground with tired showers. Great stopping place for the area. We camped at Tiki RV Park & Campground in a Motorhome. There are ferry services that go back and forth to Mackinac Island. Along the waterfront there is a walkway with benches. Nice to sit and watch the ferries (with their rooster tails), watch people, take pictures of the lighthouse and read. There are some fairly good restaurants and cute shops. 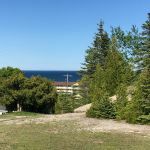 There is also a Bridge View Park that affords a gorgeous view of the Mackinac Bridge. Lovely place!!!!! The town of St. Ignace is beautiful! Really beautiful. It is somewhat touristy, but nothing like Mackinaw City. The main town is along the waterfront as well as everything else. Many restaurants and tourist shops within 1 mile of the park. Mackinac Island is a great way to spend a day visiting the sights there which we did by bicycle. Great pizza @ BC pizza. Fireworks are a regular Saturday night feature on the waterfront until early Sept.
Good access to St. Ignace town. You can walk to Java Joe's Cafe. Good food, very friendly owner. Not bad pizza. On a side note, if you want a great burger and fries, be sure to check out Bentley's in downtown St. Ignace. Casino not far away. Mackinac Island for day tripping: must ride a ferry. Campground offers discount ferry on Scheppler, but Chamber of Commerce has $15 coupon book for a twofer ferry ride on any ferry line, Mackinaw City (across toll bridge) for restaurants, bars, specialized ferry rides. Day trip to Sault Ste. Marie and surrounding areas. Nice casino nearby. We used Shepler's Ferry. Go by 9:00 and the ferry goes to Big Mac bridge and tells you info about the construction. Waterfall nearby. Mackinac Grill was very good. The Mexican restaurant just a couple of blocks north, Jose's, is excellent and the Pastie restaurant just across the street is great also. Shopping and eateries are within a mile of the RV park. Ferries to Mackinac Island are also within a mile of the park. Access to Ontario, Canada is a hour drive north. Make sure you have cash to pay for bridge toll into and our of Canada. Credit/Debit cards not accepted. Have a passport. Leave your firearms at home. You can't take them into Canada. Soo Locks just before International Bridge. Java Joe Cafe is a small, local cafe is within walking distance to the park. Go see the view of the bridge from the lookout. St Ignace at time of visit was looking a little tired. Lots of tour boats coming and going to Mackinac Island. If you have a Direct TV account, you can connect your receiver to the park's dish so you don't have to worry about trees being in the way of the signal. 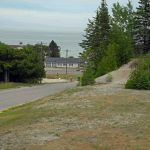 The park is VERY close to the ferry docks to Mackinac Island (a must see). Nice assortment of restaurants in town. Try the fish tacos at Jose's! Bridge View park is a great spot to take photos of the Mackinac Bridge and sunsets, too. If you are going to Mackinac Island you can get a free shuttle to the ferry docks. All the touristy items, restaurants, state parks, museums and Mackinac Bridge and view within 10 minutes. We visited Pictured Rocks National Lakeshore (2 hr drive), Taquamenon Falls (1hr drive) and Mackinac Island ( a must see with ferry boats less then a mile away). There's a fantastic fudge shop at the bottom of the hill that you can walk to. Timmy Lee's Pub, 748 Hey 2, St. Ignace has the best cheese burgers and fries, friendly staff and $2.00 drafts. Deer farm in town, feed new borns from a bottle. location is just a few miles from the center of town or from the casino. 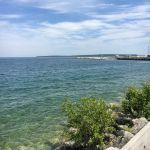 A walking tour in St. Ignace is relaxing. This time of the year mosquitos and May Flies are bountiful so apply DEET liberally. Try the local favorite, PASTIES, and locally produced chocolate. Are you affiliated with Tiki RV Park & Campground ?